In many contexts, having a sexual orientation or a gender identity that does not conform to mainstream norms is considered a mental health issue, despite WHO declassifying homosexuality as such back in 1990. To mock that belief, a powerful strategy is to revert that argument and expose Homophobia and Transphobia as the real issues. “Homosexuality is not an illness, homophobia is” is an often heard slogan. To take this argument further, a good direction for action is to propose a CURE and to stage this in various ways. 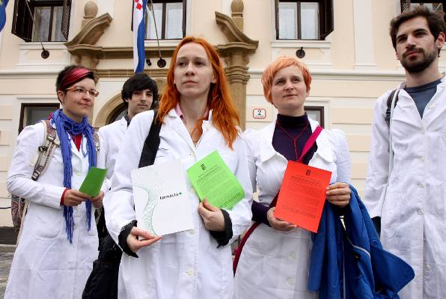 Activists in Croatia lobbying their national government known for its homophobic statements have used this approach to deliver to each Government minister on the IDAHOT a specific mock medical certificate, where all of his/her ‘symptoms’ were identified. These ‘symptoms’ were a compilation of all the homophobic remarks they had made, or the absence of support statements when they were asked for. It also included all the support given to notoriously homophobic groups, such as religious fundamentalist groups. The action allowed not only to ridicule the government but also to mainstream the underlying causes of homophobia: ignorance, intolerance, censorship of critical thinking, etc. The activists, dressed as doctors, delivered the “prescriptions” directly to each Minister as they were exiting the government building after a meeting, in presence of so much press that the ministers could not escape from the ‘confrontation’. This format of action can be replicated with many different targets. 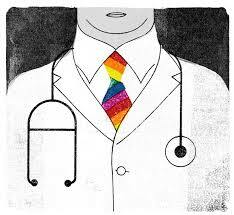 Homophobic medical authorities could be a particular good focus, as the prescription from false doctors would also be a way to question the competence of the formal authorities.